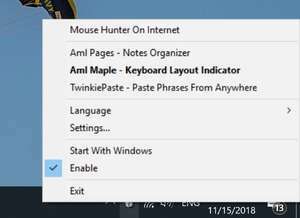 Mouse Hunter is a free utility that optimizes the work with the mouse wheel. When you spin the mouse wheel it scrolls the UI element that is located under the mouse pointer, not the element that has the input focus (which responds to the keyboard input) as it usually happens in Windows. It works with almost all applications. For security reasons, you should also check out the Mouse Hunter download at LO4D.com which includes virus and malware tests. Additional screenshots of this application download may be available, too. 4 out of 5 based on 13 ratings.